World Leader in Electroless and Electrolytic Plating Performance! Uyemura, the industry leader in electroless nickel plating and plating control, presents the STARLiNE-DASH 4-NP, the most advanced process control technology for EN plating. DASH 4-NP samples the electroless nickel plating solution, analyzes nickel and pH values, and replenishes automatically. 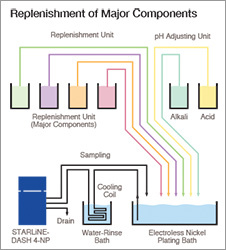 As a result, baths can be maintained continuously at 2-4% of optimum, nickel can be controlled within +/-0.05 g/L, and overall plating rate can usually be increased. Exceptionally "green;" plating rinse water cools sampling solutions, for example, precluding the need for additional cooling water. And because it reduces the amount of chemistry used, and the parts rejected, 4-NP contributes to pollution prevention. STARLiNE-DASH 4-NP operators review system history, establish sampling schedules, calibrate bath sensors, and specify tolerances; the system does the rest. Deposition rates are kept exceptionally uniform. The plating line can perform at maximum productivity, even when loading is highest. Management has a proven way to control costs and rejects. This fully automatic plater uses high speed rotation and centrifugal force to optimize electrical contact between the plating material and cathode. 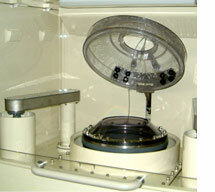 It also uses inertia when the equipment brakes to a rapid stop to force fluid mixing of the plating material. This ensures a homogeneous deposit thickness, as well as high current density operation that is substantially greater than what’s technically possible with conventional barrel plating. The RP-2 is ideal for electrolytic plating of nickel, tin and copper plating, as well as fine powders. Process plating (first plate, rinse, second plate) can be performed in one module. The number of modules can be increased to suit user specifications.